Terlato Wines chairman Anthony Terlato is partnering with Jack Nicklaus and his son, Gary, in a new Napa wine venture. • The Golden State and the Golden Bear are teeing off with a new Napa Valley Cabernet. Professional golf legend Jack Nicklaus will lend his name to a new line of red wines to be produced by Terlato Wines International. The inaugural two wines, to be introduced at the upcoming PGA Memorial Tournament at Muirfield Village Golf Club in Dublin, Ohio, come from the 2007 vintage. In addition to a Napa Cabernet, there will also be a Jack Nicklaus Wines Private Reserve, a blend of Bordeaux grapes and Syrah. Nicklaus joins the ranks of PGA stars Mark O’Meara, Ernie Els, Arnold Palmer and Greg Norman among golfers sporting their own wine labels. • When George W. Vanderbilt lived at his famous 250-room home, Biltmore House, at the turn of the 20th century, the dairy barn was, well, a dairy barn. Today, however, it houses state-of-the-art winemaking facilities for Biltmore Winery, which celebrated its 25th anniversary this week. Started by Vanderbilt's grandson, William A. V. Cecil, the winery stemmed from experimental plantings of French-American hybrid grapes in 1971. It obviously went well, as the North Carolina-based winery now holds 94 acres of vineyards, produces 170,000 cases of wine annually and hosts more than 600,000 visitors each year. As part of the celebration, Biltmore put Vanderbilt's 1913 Stevens-Duryea Model C-Six car, believed to be one of only 10 still existing, on permanent display in the tasting room. Unfiltered recommends resisting the temptation to taste and drive. • Unfiltered attended the Taste of Spring charity auction benefiting the Evan B. Donaldson Adoption Institute at the Puck Building in New York earlier this month. The event brought together some top New York chefs, along with some excellent wines from around the world. Chefs from Jean-Georges, Bobby Flay’s Mesa Grill, David Burke’s Fishtail and Bar Breton were all on hand to support the institute, which provides research, education and advocacy toward bettering the lives of everyone touched by adoption. Among those wineries pouring at the auction were Sequoia Grove, Louis Jadot, Taittinger and St. Francis. The Taste of Spring brought in a total of $300,000 for the Adoption Institute, including the sale of a case of 1978 Château Lafite Rothschild in its original wooden case for just $3,000, about 50 percent of its current Wine Spectator Auction Index Average. David Frost had done a Leroy Nieman label tribute to Nicklaus: Savignon Blanc, Merlot and Cabernet.. It ended up at Trader Joe's at a $9.99 price point. 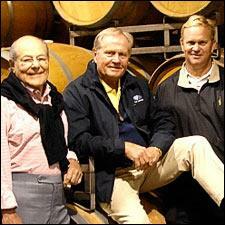 Jack Nicklaus is a truly a remarkable man and my favorite golf professional......but wine? Yes it can work and certainly he is associating with a reputable wine company (Terlato), however, when the term: "Lending his name" is used as to the degree of cooperation then I wonder. Ernie Els and certainly Greg Norman have had some serious success. But look at their involvement level. They both seem to know wine, the trade and how to market their products. Their involvement is more then merely "lending their names." They have developed serious credibility. Jack doesn't lend his name lightly, but I would definitely want to "buy" someone who is commited to a larger degree. Still it is a evolving relationship and we will see if it rises to the level of his game.